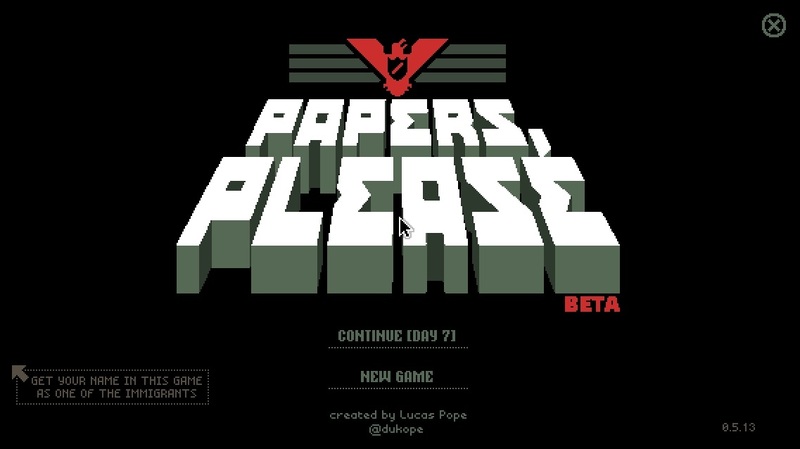 Paper’s Please is a puzzle game set in a dystopian eastern European setting created by Lucas Pope. 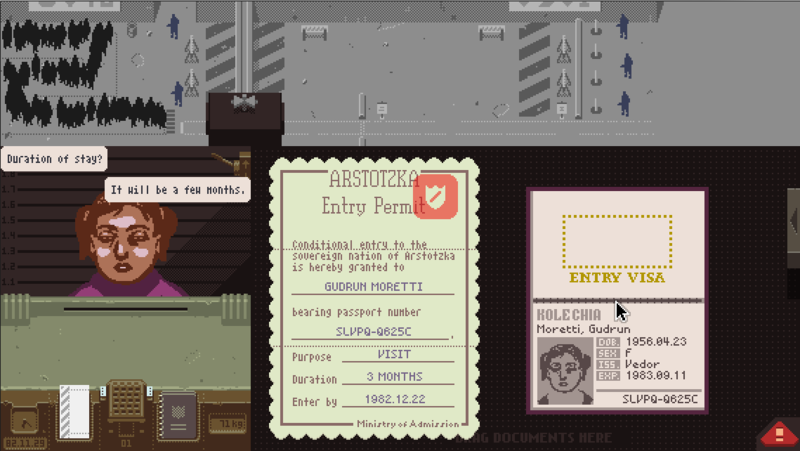 You play a border inspector and your sole task is to allow or deny people trying to enter the country. The game is currently in an early Beta, but the developer has made it free to download and test from his website. The game sports some impressive looking 16-bit (?) graphics and the overall tone of the game feels very cold war era. 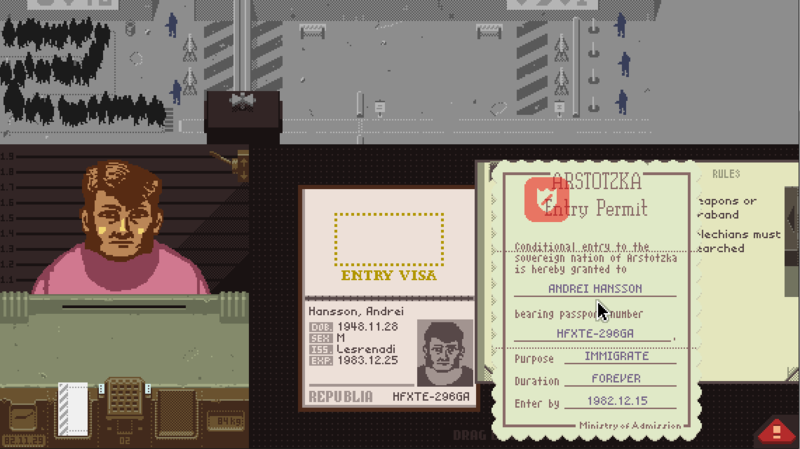 The game starts out with you, the border inspector, clearing people into your glorious country of “Arstotka”, neighboring a country who you just ended a 6-year engagement with, “Grestin.” Tensions are tight, and the amount of people wanting to enter your country are grand. Your job is to scrutinize everyone who passes through and denying anyone who has even a tiny that is suspicious. Suspicion can arise from false information on their passport, identity card, worker’s permit, or even psychical attributes such as hair looking different from photograph. There are many ways you can call them out on this, or you can just flat out deny them. For instance, if a person has a different photo from their current appearance you can ask for them to submit to a fingerprint test. If they don’t check out you have the option to detain them or just deny them. Other options including scanning them with a body scanner, checking their height, comparing their data to known data on a specific thing (location, reason for entering, etc.) It sounds complicated, and it can be, but the game does a great job of easing you into each new idea it presents. If you fail to identify a discrepancy, you will be warned, fined and then fired if you fail too many times. Taking your time is a must to make sure all variables are looked over before making a decision. However, you are also timed so taking too much time on any person is also a penalty. Currently the game is only about a half an hour-long depending on how long you take with each person, and the game is same every time you start a new one. I would like to see a random element put into the game. However, I do not think that was the purpose of the game. I think it was meant to be a quick puzzle game that tells an interesting story about post-war politics. And that it does well. It has interesting gameplay that is unique in the current market, and I’m excited to see how the game will progress as it nears a release. For more information, as well a where to get the game, you can visit the creator’s website: dukope.com. Lucas Pope also has a couple of other games on his site as well. The game is also on Steam Greenlight currently. I similar to this publish, enjoyed this 1 thankyou for putting up. no symptom of failing any time soon. This doesn’t mean that computer game tester roles will not be a breeze. High skilled programmers are experts in various development languages, their extensive training and vast knowledge of most aspect of a game makes them rare assets in this technology driven world.